Most of us look at movies as a form of entertainment, as a conduit for escapism. While this is entirely reasonable, there is also something to be said for the acknowledgement of movies as a more significant art form, especially when examining the historical biopic genre. 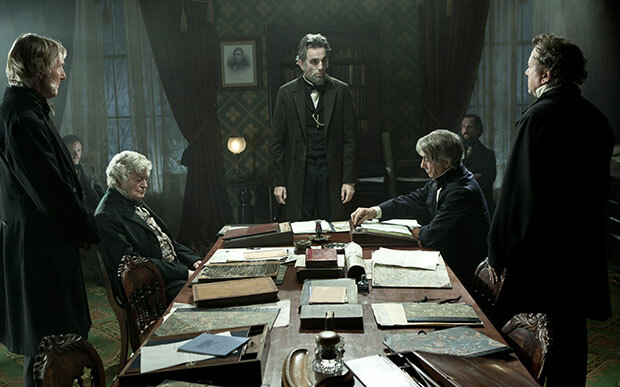 This week, Lincoln arrives in theaters (admittedly not a great place for him to be, considering) — and this new Steven Spielberg film chronicles the political wheeling and dealing of one of America’s greatest presidents. Biopics are nothing new to cinema. In 1937, Paul Muni was nominated for an Oscar for his portrayal of real-life French writer in The Life of Emile Zola. But is there a more weighted significance to biopics for this generation? And do we place an appropriate amount of stock in them? Unless you’ve been residing in a cave up until now — and by the way, thanks for making the reading of this article your first priority upon returning to civilization! — you’re well aware of the technological advances that have made the viewing of films as effortless a process as flipping a switch. As much as these streaming and viewing technologies have aided the already ravenous consumption of movies, it would be ignorant to assume that they have also obliterated book culture. In fact, downloadable books and electronic reading devices have done for the printed word what Netflix has done for film watching. However, it’s not outlandish to note the scales of public interest are decidedly tipped in favor of film. The question is, with our propensity toward regular reading diminishing, and our movie viewing increasing, when do we reach critical mass? When do we get to the point wherein biographical films become our chief source of information about the lives of historical individuals? More to the point, have we already reached that point? Lincoln may seem an odd catalyst for this discussion, given that most of us learned about the 16th president in elementary school. However, what we may or may not have learned in school, or more importantly what we may not have recalled as easily as his log cabin and freeing of the slaves, is the complexity of his parlor politics and how those maneuvers lead to the passing of the vital 13th Amendment to The Constitution. The film therefore offered many of us a new story, a new facet to this historical figure. Think back to the third grade, what was the best thing your teacher could possibly have said on any given day? “Class, we’re going to watch a movie.” It didn’t even matter if that movie was the worst After School Special or the moldiest of educational videos, we were thankful for the diversion from the chore of sifting through, and often reading aloud in groups, those dry text books. While this may be symptomatic of the capriciousness of youth, it may also be a function of the benefits of visual learning techniques. Many people retain information they perceive visually far better than information read from a book. We can usually remember details of those videos we watched in class far more readily than the things written in the textbooks. It can therefore be argued that biopics provide a viable alternative to literary biographies. This viability of course comes under fire when considering the possible presence of embellishment and bias in biopics. Films, even those with the slight education bent of a historical biopic, are principally intended to entertain, and are also susceptible to the prejudices and viewpoints of the filmmakers. With that in mind, can biopics really be trusted as a means of educating the masses on these figures, especially when telling a life story not as engrained into the collective consciousness? And if all we need is a visual delivery system for biographical information, what sets biopics apart from documentaries? The fact of the matter is that depending on the source, written biographies can be just as biased as any given film. This potential for subjectivity is augmented in the case of controversial personages, and especially politicians. Not only that, but there are documentaries out there predicated upon little more than sensationalizing a particular figure’s life regardless of factual evidence contradicting their claims. Case in point, check out the doc Alive: Is Michael Jackson Really Dead now streaming on Netflix. The movie actually supposes, using the most laughable of non-evidence, that The King of Pop staged his own death. The intention here is not to paint all documentaries and written biographies with the same unscrupulous brush, but the existence of these suspect examples should prevent an automatic assignment of inferior status to filmic biographies. One entity that certainly doesn’t overlook the significance of biographical filmmaking is the Academy Awards. One need only go to the Netflix Instant Watch genre category Biographical Dramas to see the near unending acclaim lavished upon movies of this ilk. Films like Amadeus, Gandhi, and Chariots of Fire all garnered Best Picture honors while Capote, The Pianist, and My Left Foot all netted performance awards for its leads as they occupied roles based on historical figures. Whether the cause for this Oscar success is the Academy’s acknowledgement of the importance of these films, or simply the attraction they inherently present for top-tier filmmakers, the winning streak enjoyed by biopics ensures their continued frequency of production. There may be something to the conception of biopics as an artful method of historic preservation. In that regard, the entertainment value of these films may not be a superfluous. Did British criminal Charles Bronson really get up in front of a theater full of people and perform a one-man show? No. But Nicolas Winding-Refn’s Bronson, with its distinct visuals and stellar performance from Tom Hardy, allows for an easier commitment to memory of the actual details of the man’s life that are also featured in the film. As biopics continue to draw both audiences and awards season attention, and as Oscar winners tend to be more likely to receive the benefit of film preservation advancements, what we may also be inadvertently preserving is our collective history.